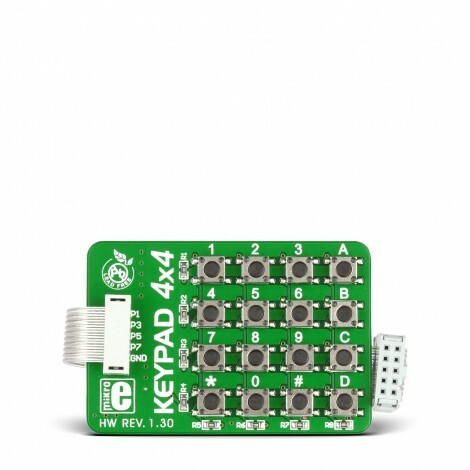 The Keypad 4x4 Board features 16 push buttons arranged in 4x4 matrix to form standard alphanumeric keypad. The Keypad 4x4 Board features 16 push buttons arranged in 4x4 matrix to form standard alphanumeric keypad. Some embedded systems that require user input in form of numbers (decimal, or hexadecimal) can use this board as a solution. Board features flat cable with female IDC10 connector, compatible with mikroElektronika development boards.